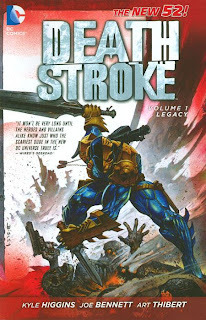 From the Simon Bisley covers that precede each chapter of Deathstroke: Legacy, the reader can easily tell that this is a comic book weird, violent, and outlandish. What's less apparent in the image of a spiky-armored Deathstroke waving his sword at a purple and green-costumed behemoth with a cape is that Deathstroke: Legacy is also meant to be deeply, deeply ironic. Throughout Legacy, writer Kyle Higgins teases the worst impulses of the DC New 52 (some of which actually manifested) and then demonstrates how Deathstroke Slade Wilson is the antidote for them. Deathstroke is terribly bloody and mercilessly violent, but its aesthetic is "old school" rather than "kewl," and that makes Deathstroke an unlikely hero for the readers even as he's assuredly a villain on the page. The first chapter of Legacy reads like an issue of Green Arrow: The Midas Touch, quite unfortunately -- Deathstroke Slade Wilson begins a mission with a trio of young, hip kids just as interested in making sure their weapons are loaded as they are that they've got an appropriate playlist for the assassination. At the end of the chapter, however, Wilson shoots the three teens in a bloody spree -- not because the kids had betrayed him, but simply because he didn't want the competition. Kyle Higgins demonstrates, on one hand, that Wilson is just not a nice guy -- bloodthirsty, remorseless, and often prideful and insecure -- and it's to Higgins's credit that he never tries to sugarcoat this aspect of Deathstroke. On the other hand, Higgins's first chapter is a repudiation of buzzwords and technobabble; Slade Wilson is older -- not far removed from his "old" DC Universe iteration -- older than his competitors and than most of the New 52 newly-rejuvinated superheroes. As he tries to prove that he's still "got it," Wilson serves as a figurehead of the "old" DC Universe -- that young and new is not necessarily better than old, experienced, and dangerous. Higgins carries this through a variety of Wilson's increasingly explosive missions. In a battle on a highway, Wilson dispatches the ridiculously mechanized "Road Rage"; later, he fights a trio of opponents known as Legacy, each visually more superheroic and flamboyant than the last. In this, Higgins continually demonstrates, Slade Wilson is tough -- tougher than the new generation, tougher than the latest fad, and tougher than the stereotypical superhero community. It's only a pity Higgins isn't able to pit Wilson against an actual member of the New 52 superhero elite in this volume (the closest the reader gets is a Blackhawks guest-spot) to fully cement Wilson's place in the pecking order. Legacy turns, in the beginning, on the contents of a mysterious briefcase shown to Wilson as a message; this ever-present McGuffin lends Legacy the character of a caper early on. When the briefcase contents are revealed as Ravager Grant Wilson's mask and weapon, however, experienced readers will get some sense where the story is going. Higgins balances tenuously between re-treading old Deathstroke ground and telling a new story -- readers have seen Slade's son Grant die before and also seen Deathsroke battle his children, and the saving grace is again Higgins positioning of Slade Wilson as the old guard proving the worth of the old ways of doing things. Joe Bennett's art is solid as always, and his depiction of Wilson -- in line with his drawing the Wilson family during the Teen Titans tie-ins to Blackest Night -- further cement this book somewhere between the "old" DC Universe and the New 52. Thoughtful as it is, however, there's no escaping that Higgins's Deathstroke is a violent book, of the kind rarely seen before in the "old" DC Universe. If chopping off arms and heads was meant to be shocking roundabouts Infinite Crisis, it's old hat here, to the point where Wilson is decapitating his victims by the second page -- and that same page is used as the book's credits page. In the book's favor, the violence feels deserved, not gratuitous, in the context of the story; there's little torture, as opposed to Adam Glass's Flashpoint: Legion of Doom, so it's action-violence not horror-violence, and Bennett is explicit but doesn't linger longer than needed. Depicting the level of violence in Deathstroke on-screen is not a positive step for the DC Universe, but if it has to happen then Higgins and Bennett comport themselves well. Deathstroke's closest tonal relation in the New 52 so far is probably Grifter: Most Wanted; both are given to knives stabbed through people's skulls, though Grifter's enemies are mostly alien, and Deathstroke's are flesh and blood. Grifter fights his battles with an effort to protect the innocent; Higgins Bennett demonstrate specifically that when Deathstroke fights, bystanders get hurt. Whereas Grifter is continuous, with the anti-hero constantly on the run, Deathstroke is episodic -- just about every issue sees him going after a different target; Higgins's stories likely read as well in a collection as they did individually, as each issue has a strong focus but also ties into an ongoing storyline. More importantly, however, whereas Grifter: Most Wanted lessens in quality as the book goes on, Deathstroke remains strong throughout, with an intriguing beginning and a striking finish. After Deathstroke: Legacy, Kyle Higgins departs the title and Rob Liefeld takes over -- previews suggest a greater tie between Wilson and the rest of the DC Universe, which is good, but also that Wilson's adventures become less grounded and more cosmic; whether that means they become even more action-packed and less thoughtful remains to be seen. Irrespective, Higgins's Batman: Gates of Gotham was an uneven introduction to the writer, but with Legacy, he's impressed. This is a mostly standalone book that ought not disappoint longtime Deathstroke fans. Later this week, Paul Jenkins and David Finch's Batman: The Dark Knight: Knight Terrors, including ... a "Night of the Owls" tie-in issue? Don't miss it! Sales figures be damned, DC should have put more faith in Higgins' take on Deathstroke. It was a smart, consistently fun run with great art. Needless to say, once Liefeld took over, I dropped the book like a stone. Congratulations CollectedEditions, I now really want to grab this volume of Deathstroke thanks to your excellent review! I won't be picking up volume 2, but it sounds like I don't need to! I'm no experienced Deathstroke reader at all, so I wonder where this will be going. Especially when he will face the Stormwatch member responsible for the "death" of his son. I will continue with the next trade by Liefeld. It's only one trade right? Is there a solicit that says Deathstroke will face Stormwatch, or are you just wondering when it'll happen? I noticed that familiar chin and I was hoping more would be made of this, too. Hopefully that storyline didn't leave with Higgins. They really pimped up Deathstroke's strength by the way, with him ripping out a plane door in the air! But we'll see. Woah! This actually sounds great, like a fun promising book.